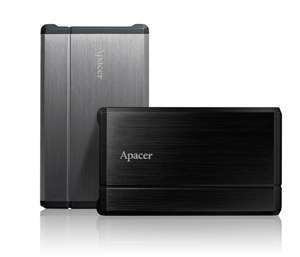 Apacer company introduced its first high-speed external hard drive Apacer USB 3.0 AC430. Apacer AC430 has read and write speeds at 92 MB and 85 MB per second respectively, which is three times faster than they can develop drives that support the standard connection USB 2.0. The drive is available in versions with a capacity of 500 and 640 GB. Apacer AC430 enclosed in a thin aluminum body, decorated with stylish slim-line-divorce, by which the unit looks very stylish. Among the advantages of the device, according to the manufacturer – the stability of long-term use and built-in anti-shock “that protects the device from the failure information transmission and increases the integrity of the data. Apacer AC430 connected for plug and play and is backward compatible with standard USB 2.0, and built-in storage system for energy storage device automatically enters into standby mode after 10 minutes, which not only effectively reduces the power consumption, but also extends the product life cycle.